Welcome and thanks for stopping in to think with me through some questions that I believe need to be asked. Let me start off by saying I’ve been in fulltime ministry for over 20 years so I’m not talking from theory, from conjecture, or anecdotally. I’m talking from real life observations and insights born in real life ministry experience. I hope you’ll find things here that’ll entertain you, some things that’ll offend you, some things that’ll make you question what you hold as conviction, and some things that’ll kickstart conversation with the people around you. Part 2 (Spiritual Spectacle) and Part 3 (Ministry Hustle) will be coming later and directly connect to this one. I’m currently in the last week or so of a 5-week sabbatical. This is only mostly irrelevant to the issue of vision, but not entirely. As I’ve been in ministry myself and seen a wide variety of ministries over the years, I can see where vision is and where vision isn’t. Or at least where it isn’t obvious to the outsider. I recently had the opportunity to visit two well-known “mega” ministries: North Point Church in Alpharetta, GA with Lead Pastor Andy Stanley and NewSpring Church in Anderson, SC with Lead Pastor Perry Noble. Both were dynamic in different ways and both had electric atmospheres in different ways. Both experiences were enjoyable and both were experiences I’d love to repeat if given the chance. When I walked into North Point, I was immediately in awe of the sheer size. 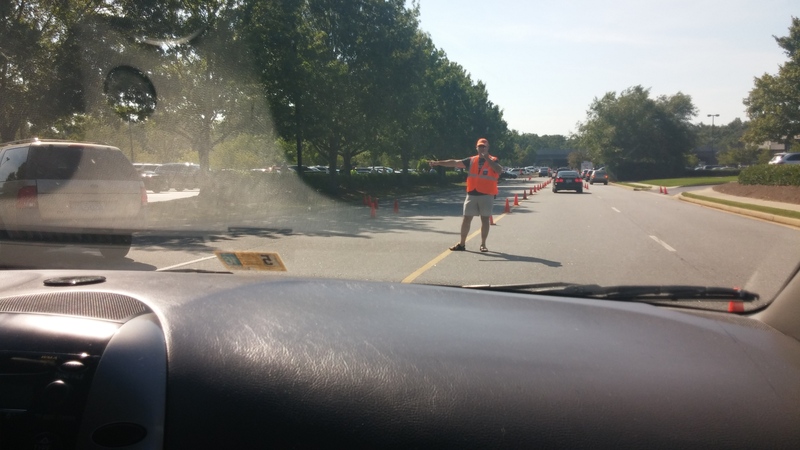 Driving in, we were directed to an open parking spot by several different traffic-directing volunteers. We walked in along with a horde of other worshippers. You probably couldn’t go 15 feet in any direction and not see another volunteer in a Northpoint shirt. I even commented to one of them how striking that was. Another one of them showed me around after I asked about the student ministry. He clearly loved his church and was happy to help me. It was seriously impressive, it really was. As the service got underway, I had (at least at first) a slight feeling like I was watching the recording of a television show. As if I was part of the studio audience for something ultimately for far more people than were in the large auditorium we were in. And we were; there’s no question that North Point is a global ministry. It was unmistakable, at least to me. We enjoyed the service, the worship music, and the message by Clay Scroggins. (I happened to see Clay in a hallway before the service and had to deliberately “play it cool” so I didn’t totally geek out.) The service ended, we made our way out of the sanctuary auditorium, helped myself to another eyeful of the student ministry area, snapped some pictures, and walked out of the building. Great time, great teaching, great ministry, and a great Starbucks gift card given to first-time visitors. Overall, great. 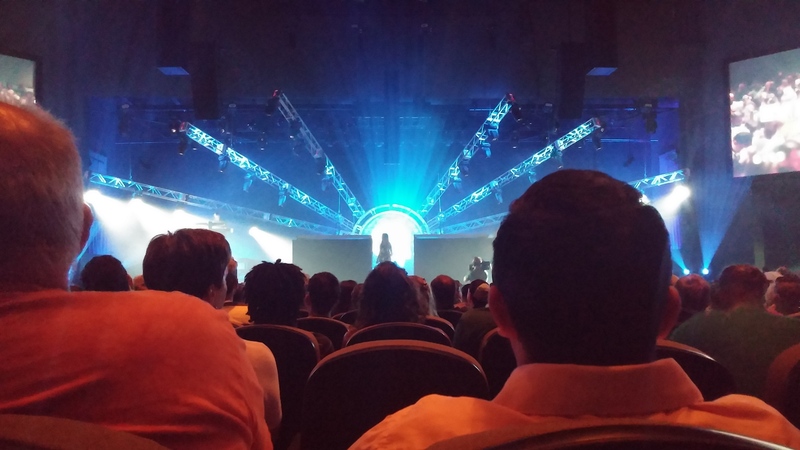 If you want to see the service I attended for yourself, click here. 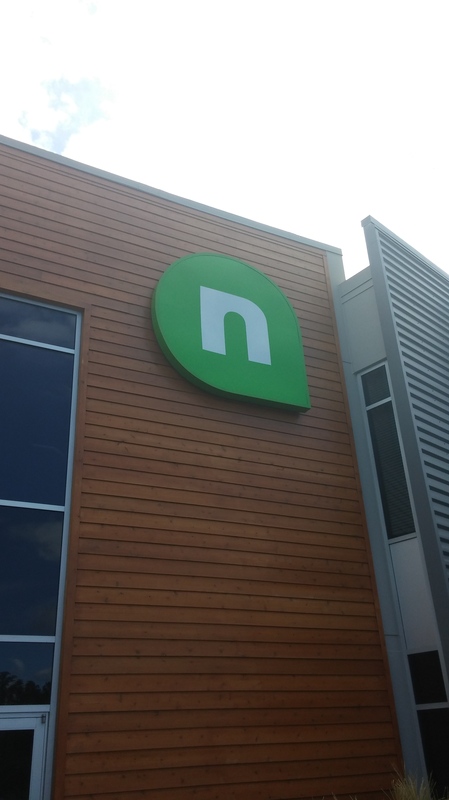 The following Sunday I attended NewSpring Church in Anderson, SC. Let me preface this by saying while I had never been to NewSpring, I do have a friend named Joel Tippitt on staff as Group Director. So, I came into the building and already had someone specific to look for. Not sure if that taints my objectivity, but I don’t think so. Keep reading. Backstory: I actually arrived in Anderson on Saturday even though I told Joel I’d be there Sunday morning. 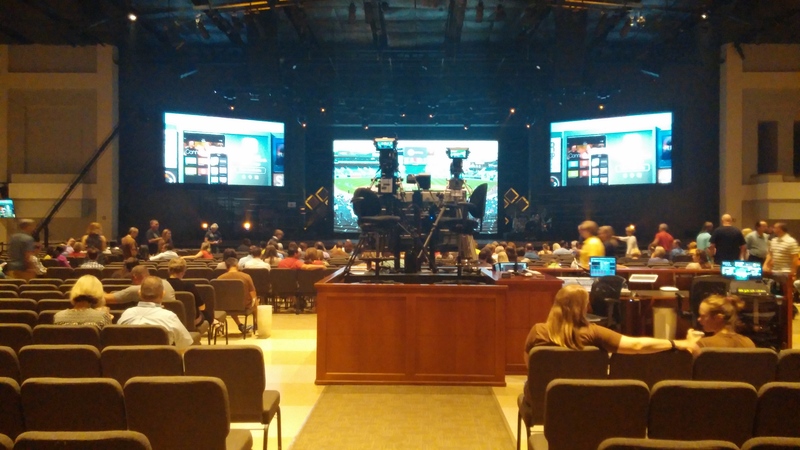 With a rental car and nothing much to do (my family had dropped me off on their way home to VA from vacation time in GA), I decided I’d go to NewSpring to see if they had a Saturday night service. Turns out they didn’t, but it also turned out that I got way more than the potty stop I had planned for. As I drove up to the mostly empty parking lot, I could see one of the many front doors propped open. I’m not shy so I walked right in. I immediately saw 10-12 adults setting up for baptism the next morning. I spent about an hour and a half talking with them. What struck me most was their passion for what was happening at their church and how that was so clearly connected to the vision of that church. 18 people celebrated baptism during this one particular service! So, back to Sunday morning. I met up with Joel and he showed me all around the church facility, introducing me to people and continually connecting every area, every effort, every role to the vision of the church. Ultimately we ended up in the “VIP” room where first-time guests are welcomed after the service. 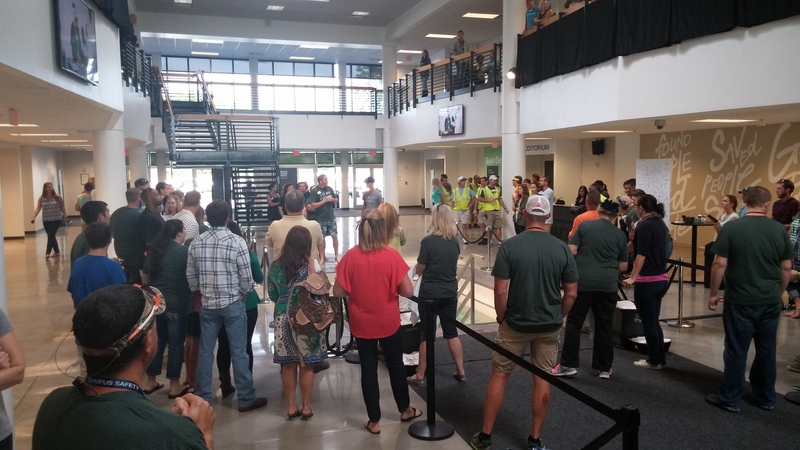 While first time guests certainly ARE Very Important People, the “VIP” actually stands for Vision, Information, and Prayer because these are 3 things NewSpring Church wants to communicate to new visitors. You see, when you come to NewSpring, you’re not leaving without being crystal clear on the vision. I was struck by a large floor-to-ceiling mural in the VIP room that displayed the 5 points of the vision of the church. From the countdown intro video that kicked off the worship service, to the response/invitation at the end of the service, to nearly everything you saw and experienced there, the vision was integrated and articulated. If you want to watch the service I attended for yourself, click here. North Point is an incredible ministry doing incredible things being led by God’s incredible Spirit. No doubt about it. 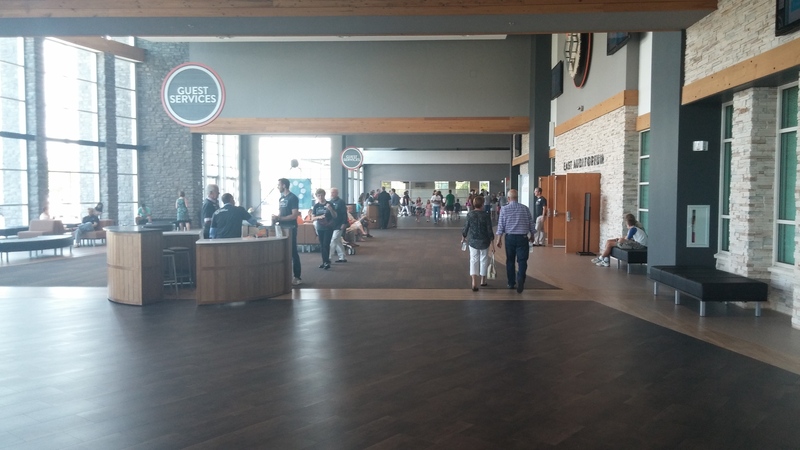 And my personal connection to a staff member at NewSpring afforded me a unique perspective that wasn’t there at North Point. Both excellent, both used of God. So, what is the deal with vision? Is vision unique to an individual pastor/leader? When a pastor/leader transitions from being a pastor/leader of a particular ministry, do they take that vision with them? Does the new pastor/leader bring a new vision? Where does vision come from? How is it born? How is it cultivated and communicated in such a way that it invades every square inch of the heart of each person and every square inch of space occupied by that ministry? Can vision be overstated? Can vision be made overly complicated? Can vision be uncompelling? Is uncompelling even a word? The matter of vision must first be a matter of Scripture. The Church doesn’t need a dynamic visionary pastor as much as it needs to understand its God-given mandate. No hyped-up, slickly-rehearsed, creatively-contrived presentation based on human ingenuity is necessary. The vision: Make disciples. I love that. I love how those 2 words completely level the field between mega-ministries like North Point just north of Atlanta, GA and small-town single-room churches like the one I grew up in in North Cape May, NJ. No matter which one you’re at, we’re partnering with God to do the same thing: Make disciples. The matter of vision must secondly be a matter of prayer. Our two-word mandate is a given. But every pastor/leader possesses a unique personality, character, charisma, humility, and –ahem— even “style” all their own. In other words, the methodology between two pastors who lead the same church can be wildly different indeed. What is the vision exemplified by the pastor/leader of the local church you’re a part of? How would you articulate it? What does he seem to be trying to accomplish? And why? You see, when vision is based on prayer that leads to submission, the vision of a particular pastor/leader can take on a variety of complexions. That is why I can pray for, meet with, and support a small army of fellow pastors in my community because I know that my ministry “style” may not be (and certainly isn’t) everyone’s cup of tea. So I’m thankful when I see people connecting to Jesus and His Body across town because I’m part of Jesus’ Body too. I learned from my dad (the lone pastor of that small church in North Cape May) this incredible truth: “Genuine ministry is never jealous.” Maybe you’re a pastor/leader reading this and you need to stop right there with that statement, take it to God in prayer and confess your jealousy of other ministries and leaders. I’ve had to do that very same thing on more than a couple of occasions. So, what is the vision of YOUR local church? Does your pastor know you’re as excited about the vision as they are? Is the vision of your church communicable to those who aren’t yet a part of it?